UPDATED 6:26 PM Emanuel files an emergency motion to stay the Appellate Court Ruling pending appeal via Capitol Fax. You can read this story from the NY Times. You also can read a round-up of consequences from the Capitol Fax. It makes you wonder doesn't it? 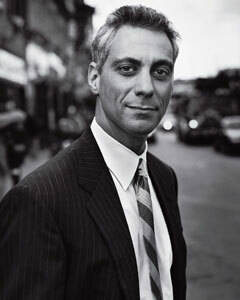 Who wants Rahm Emanuel off the ballot? To be honest I haven't really been paying attention to this story as I already knew that the Chicago Board of Election voted in Emanuel's favor. I knew about the court case as well, but this for some was an unexpected ruling. All that can be said was well I was glad to see him take a stand on the Red Line extension, but it doesn't do him much good if he's no longer on the ballot.